WELCOME, N.C. (October 23, 2018) – Honoring the best driver to ever race at Martinsville Speedway, Pioneer Records Management, a division of Pioneer Technology Group, announced today they will primary sponsor a special Petty Blue No. 43 Chevrolet Camaro ZL1 in celebration of the “The King” Richard Petty and his record 15 wins at the track. Darrell “Bubba” Wallace will race the No. 43 that ruled Martinsville throughout the 1960’s and 70’s. The No. 43 will be primarily Petty Blue in color with the Pioneer Records Management logo on the hood and sides. 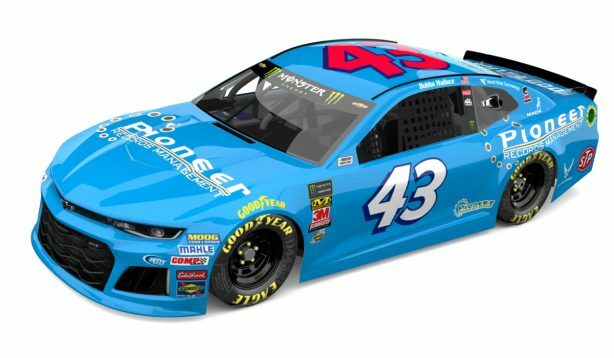 Pioneer has been an associate sponsor of the Richard Petty Motorsports team since 2016 and wanted to honor Petty at the track he had his most success. Petty has 67 starts at the track and finished in the Top-Five in 30 of them- nearly half of his starts. He finished in the Top-10 in 55 percent of his starts, won 15 and led over 2,800 laps. Pioneer Records Management will have the resources they need to bring back the memories of Petty at Martinsville. Their new offices located in Yadkinville, North Carolina was responsible for digitizing and organizing thousands of historical Petty-related documents including financial agreements, contracts, photographs, competition notes, marketing and promotional materials and more one-of-a-kind documents. These documents will be highlighted on social media leading into the race weekend and show fans a unique history of Petty. Pioneer Records Management has the capability to index, digitize, organize and securely store files online for various businesses and government offices. The First Data 500 will be held at the Martinsville (Va.) Speedway on Sunday, October 28 at 2:30 p.m. ET. The race will be televised live on NBC Sports Network and broadcast on MRN and SIRIUS/XM NASCAR Channel 90. Pioneer Technology Group (PTG) is a leading developer of software solutions and services for government, real estate, and a wide variety of industries. The company, headquartered in Sanford, Florida, develops and supports official records systems, court systems, and tax systems for counties and municipalities. PTG also provides paperless systems for title insurance and real estate, and scanning services for converting paper to digital images through its subsidiary, Pioneer Records Management. For more information about the company, please visit PTG’s website at http://www.ptghome.com.